To be a pen collector in Japan is a wonderful thing. Brands lavish attention on the Japanese market with all kinds of special editions and limited editions. Caran d’Ache seems to be one of the more assiduous, and the variations of 849 ballpoint pens and Ecridors can be difficult to keep track of. 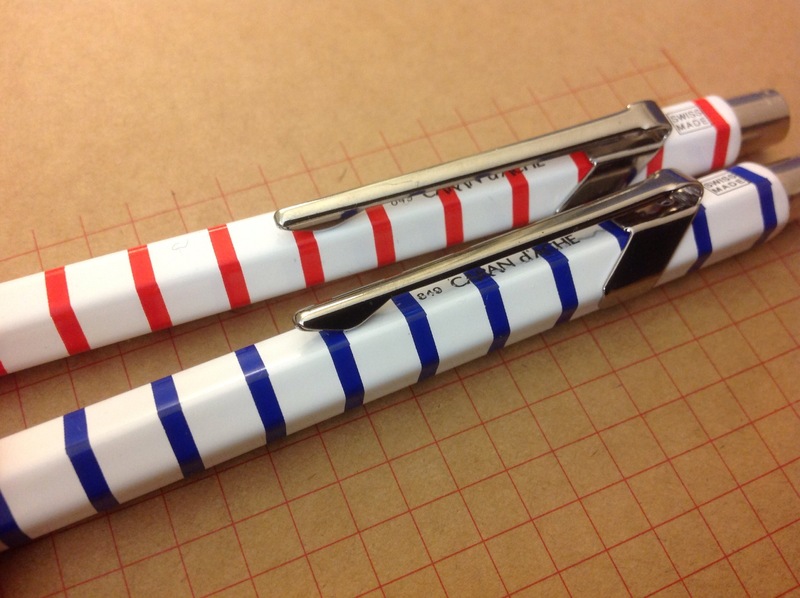 I’m not sure if “Marinière” is limited to Japan but it does say that only 2,000 pens of this particular design will be released there. Now, I don’t buy ballpoint pens as a rule, but there is something about the pencil-shaped silhouettes from this particular house that speaks to one’s heart. Caran d’Ache really knows how to make the most of its heritage, reproducing the classic beauty of the pencil on its flagship products. The overall finish is a bit disappointing. If you look closely, the red and blue lines are not perfectly straight, as if the paint was applied like a ribbon to a rotating body while the pen swayed a bit, and the end of the “ribbon” is a bit off. Also the Caran d’Ache logo imprint on the blue pen is imperfect. Am I being nitpicky? Yes, but then it’s supposed to be Caran d’Ache! Well, this may have been for the better since I decided to take them out and use them, given the slight imperfections. Actually a more serious problem I have with the pen has to do with the ball tip. As a fountain pen user I tend to write with the pen at a lower angle, say about 30 to 40 degrees, but Caran d’Ache seems to expect its users to write at a much steeper angle, and the tip starts to scratch if I hold it lower than about 45 degrees. I’ve never had this kind of problem before with any other ballpoint pen I’ve used up till now and it is disappointing that it should happen with a pen that uses such expensive refills. 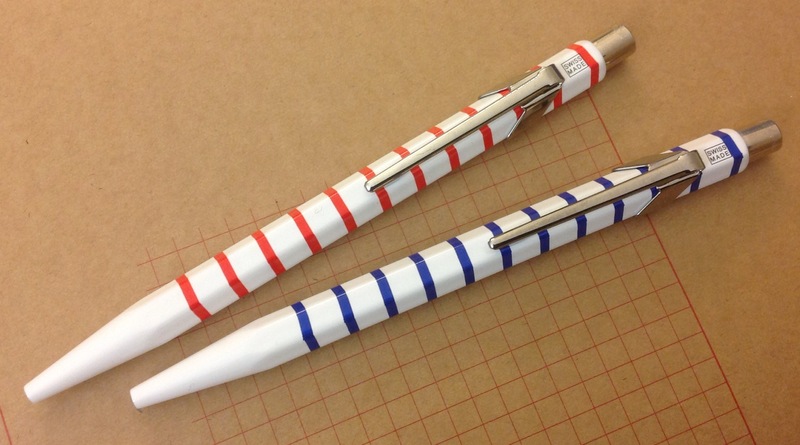 They are beautiful, quite ‘nautical’. I use CdA’s mechanical pencils, but would normally also avoid ballpoint pens. Do they not offer this one as a mechanical pencil?